Ahmedabad: As 2008 ends, it will take away an era with it. All copyright on the works of Mahatma Gandhi will end on 1 January. That effectively means any publisher can publish Gandhi’s works—running into some 200,000 pages—without seeking permission of or paying royalty to the Navajivan Trust, the sole custodian of Gandhi’s writings and speeches. “Gandhiji himself never wanted copyright law, but later accepted it following some misrepresentations of his writings," recalled Amrut Modi, managing trustee of the Sabarmati Ashram Preservation and Memorial Trust. Since its inception in 1919, the Navajivan Trust has published some 300 volumes of compilations of his articles, letters and speeches, apart from translations of his autobiography. Unfazed by the expiration of copyright, managing trustee Jitendra Desai reasons: “Even in profiteering, they would propagate Gandhian thought." 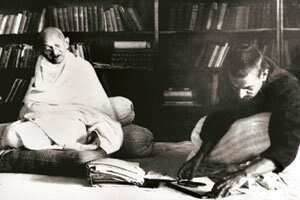 The trust would continue to sell Gandhian works at subsidized prices, he said. For example, he said, when deliberations on global warming heat up, the trust plans to publish Gandhi’s writings on human settlement and its linkages with environment to publish an anthology on the subject.